The Pigger concept consists of a palatable liquid ready-to-use UHT milk with a long shelf life due to advanced production technology. In combination with an innovative feeder, this concept promises modern farmers vital piglets, increased labour convenience and an improved return on investment. The Pigger product is a palatable ready-to-use UHT milk – uniquely delivered as a liquid – and based on food-grade dairy ingredients to ensure the highest protein quality and thus a highly digestible product. In addition, it provides the piglets with the enriched nutrition they need, resulting in vital piglets with high growth performance. The product has an exceptionally long shelf life of twelve months unopened and eight weeks opened. There is no need to add water as the product is delivered as a ready-to-use liquid milk, which ensures it is hygienic and guarantees ease of labour. In addition to liquid feed, the Pigger portfolio includes high quality dry feeds. 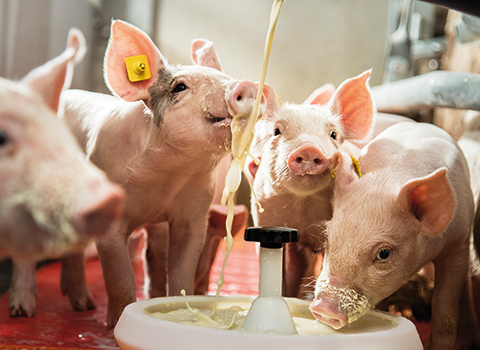 These dry feeds are based on the same high levels of food-grade dairy ingredients to ensure a consistent taste perception and ease transition for the piglets.